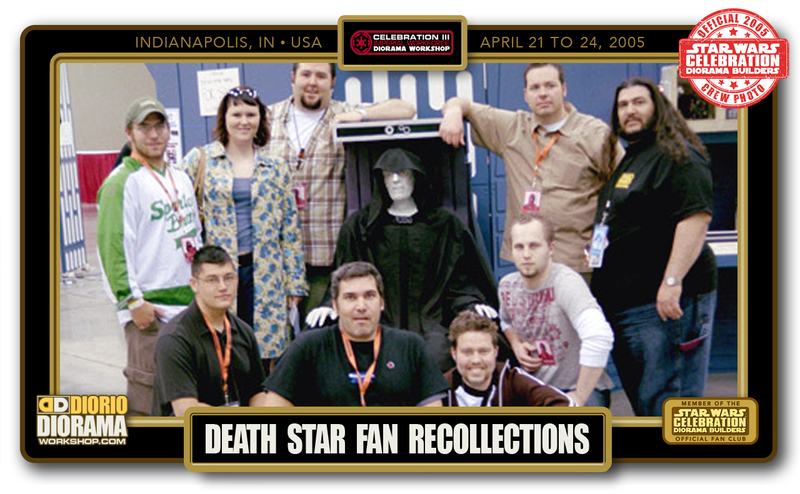 Welcome to the OFFICIAL Star Wars Celebration III Death Star Diorama Builders workshop site featuring my EXCLUSIVE CREW COVERAGE not seen anywhere else on the web. Feel free to share your Celebration III Diorama Workshop experience with us – Good or Bad – Help us make the next ones better with your input. Simply send me an email to DIORAMAWORKSHOP.COM@GMAIL.COM and I will add it to this page. You can also comment at the bottom of the page about the comments 🙂 LOL. I will get the ball started, please Don’t be shy !!! FRANK DIORIO : This was the real test for me, was the success of the Celebration II Diorama Builders just a fluke coincidence ? Or was making dioramas an activity the fans really enjoyed coming to. Well, I guess I don’t have to tell you the answer to that question now do I ? LOL. I Think for me the best part was having Local Montreal friends come and help share the experience with me after telling them what a blast Celebration II was. I was expecting about the same number of people who came to build at CII but was shocked when that number showed up JUST on DAY ONE !!! I may have been a little disapointed that the final Death Star didn’t align as perfect as I had envisioned ( my perfectionist side of the brain) but it really did turn out great. This could be the easiest of all the convention designs for you to rebuild at home. PATRICIA ROY : My first convention was in Indianapolis. I was happy to set foot in the city for the first time. What I remember the most are the days prior to the convention. The setting up! Frank had a huge project for us. We were painting wooden boards that would later be the partitions for our reserved space. We were painting, and painting, and painting. ‘Till the late hours of the evening. Haha! I went to bed that night utterly exhausted. On opening day, we realized we should have pre cut the foamcore. Some very nice young man offered to do it and he cut foamcore nonstop for three days without complaining and strangely, without really talking to anyone. We never knew his name and never saw him again. Sometimes I wonder if he’s cutting foamcore in his basement just for fun. I had no idea what I had gotten myself into. I hadn’t seen the plans for the dioramas so I had no idea what people were supposed to be doing. I gave myself a crash course of the basics and tried my best to help out anyone who needed me. Turns out, I was pretty good at chatting with the folks and helping them have fun at our kiosk. I attended only two events during the convention: the incredible 25 minute play about the original trilogy and the showing of old 70’s and 80’s commercials about Star Wars toys and such. JAMIE FOLLIS aka SILLOF : I remember at C2 just being happy that I had found this awesome room full of stuff I did just on a level exponentially bigger and better than what I had been doing. I did not know Frank or his site, I was just there helping set up as part of a local fan group. Coming back for C3 it was great to see familiar faces and it was the real start of what keeps me coming back for each celebration. There is a real sense of family, maybe a dysfunctional family, but a family none the less. I never imagined I would see workers, the fans, the kids who come back year after year to work. We have seen kids literally grow up from kids of age 6 or 7 to 20 year olds who come back. For me, other than Patricia’s finger incident ;P it would have to be just the size of the 2nd workshop. To understand what I mean you have to realize that at the previous celebration we were basically in a glorified conference room with 2 sets of single doors. Then I come into this cavernous hall expecting a basically similar set up but instead there was this huge area for us. Frank and everyone were feverously constructing these massive death star wall panels that served as part entry into the workshop, part divider for our area, and part display shelves. Two of my dioramas were displayed on those shelves and featured on Star Wars.com and I thought I had really made it. We basically built a movie set just for a few days and then I think we just left them there. I still have the shorts that got ruined with all the splatter of the death star blue grey paint from all the panels I painted. It was just the awe inspiring thing that I was proud to be a part of. It also went so much smoother than C2. C2 seemed like we were just kind of making it up as we went. This time Frank had done so much prep work and was just a huge leap in size, scale, and finished product. But that is part of what makes these things great, Frank is always pushing to make the workshop bigger and better.